The wait is finally over, friends! 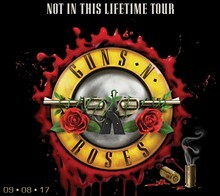 Guns ‘N’ Roses are about to melt out faces off this Friday at the Alamodome and we really couldn’t be more excited. Despite how terrible a corn-row rocking Axl Rose sounded during the 2002 MTV Music Awards, recent reviews of their live shows have painted Rose and the boys quite stellar. And with the band approaching their 18 month on the road (not exactly an easy feat), it’s pretty amazing what these guys can endure with what the majority of the band in their fifties. And with how much our town holds on to rock ‘n’ roll, Guns ‘N’ Roses isn’t just the band that gave us hits like “November Rain” and “Welcome To The Jungle.” To us, they’re legendary rock gods and we’re ready for them to take us to church. But Wait … there’s more … Motherfucking ZZ Top, the legendary Houston rock group that gave us hits like “Tush” and “Sharp Dressed Man” are opening the show for what might be one of the best concerts of the year.